I figured I would sign up for Sugar Geek Show month-to-month, if I didn’t feel I was benefitting, I could easily cancel. Upon becoming a member though, I have learned sooo much. Being a Sugar Geek really elevated my work. The result is much higher-end, professional-looking cakes, which in turn, I charge more for and clients are willing to pay for. So the membership really pays for itself, it’s a worthwhile investment. YouTube is great and all… but it can be a sinkhole for your time when not every video you watch is beneficial or poorly executed. I love how so many of her techniques can be translated into other things, since becoming a member, I feel like the vision in my head of a cake is actually being translated into my hands from what I’ve been learning. 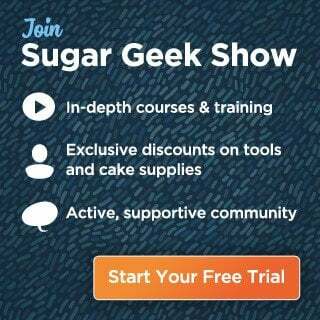 I love the fact that I can count on Sugar Geek tutorials to be beneficial and have solid content consistently. When I first started out, my biggest problem was that I had these cool ideas for cakes in my head, but had no clue how to execute them. YouTube is great and all… but it can be a sinkhole for your time when not every video you watch is beneficial or poorly executed. I love the fact that I can count on Sugar Geek tutorials to be beneficial and have solid content consistently. I also love that I have really down-to-earth interactions with Liz and Dan. I absolutely love watching the live videos with Liz working together with her husband Dan. It makes learning fun and entertaining.